Supposed to be cleaning the basement today, but ended up sorting through a box full of half-forgotten rolling stock that I've picked up second-hand over the years. Obviously I had to give them a spin on the layout. (“Just to see if they’re still working, dear"). 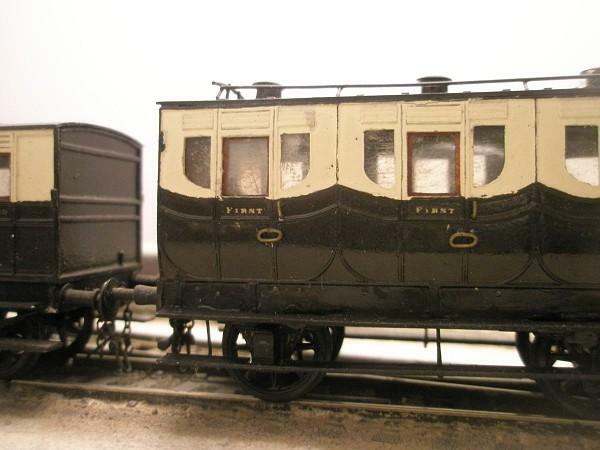 According to Russell, this First Class coach was originally built by Wrights for the Chester & Birkenhead Rwy, before being taken over by the GWR. The origins in stage coach design are very obvious, including luggage rack on the roof. For an artistic interpretation of what the compartments would have looked like inside, have a look at this painting. Victorian elegance in full flourish – but only for some! By contrast, the “Thirds” look cramped and boxy. 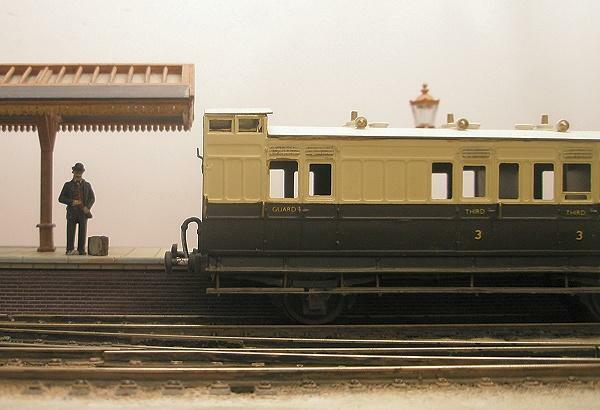 Apparently, many of these were built for branchline service. The photo in Russell - on which I suspect this one is modelled - appears to show an example from the Culm Valley. Provision of Third class coaches became mandatory for the railways in the 1844 Railway Act. Incidentally, the Act is available for download here. 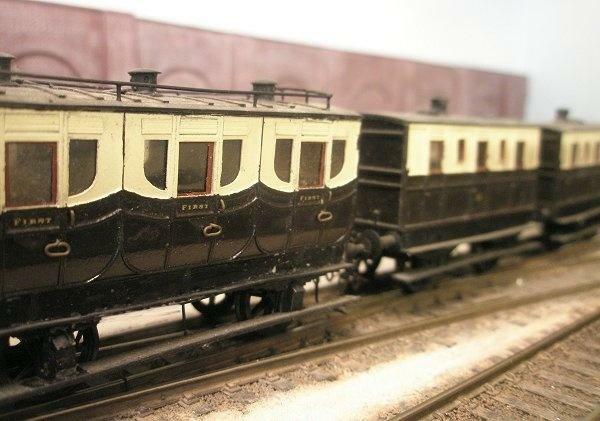 Here’s another rather unusual rake of coaches! 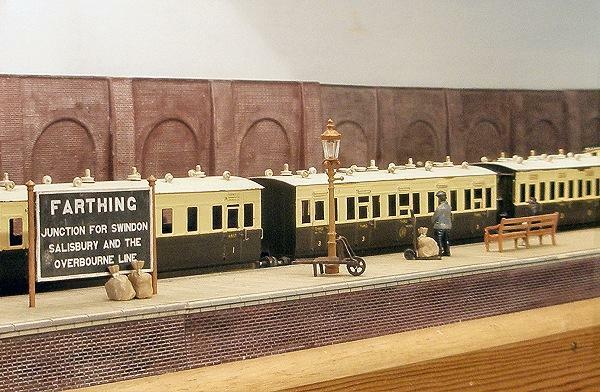 I bought them on ebay some years ago - there was no photo, just a brief description of a set of “kitbuilt GWR coaches” in etched brass. 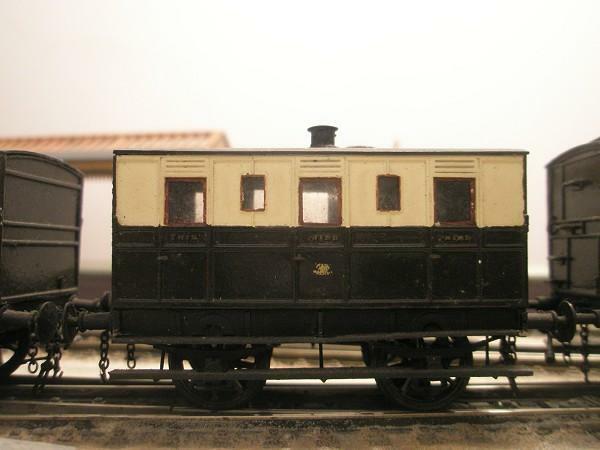 It turned out to be NER branchline stock from the 1880s, built from Connoisseur kits, but painted in GWR 1930s livery! Perhaps the previous owner used them as examples of GWR Workmen's coaches? 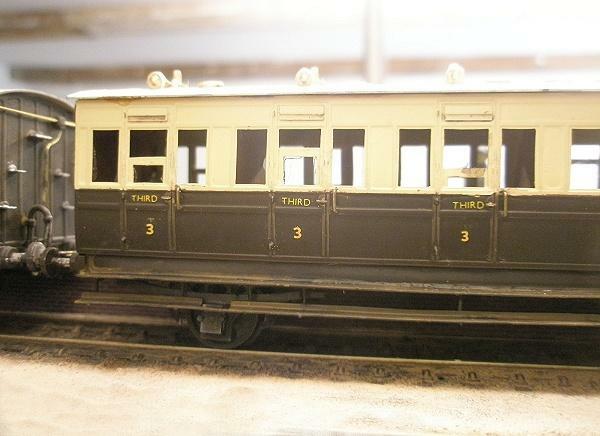 My initial disappointment soon turned to interest, when I discovered that the NER sold many of these coaches off to light railways prior to WW1. I'm currently pondering whether to backdate them and employ them on "The bay" as absorbed coaching stock, acquired with the take-over of the Overbourne line - as per the Lambourn Valley Railway coaches. The NER introduced the coaches in the 1880s. This Brake Third was to Diagram X. I have always liked "Birdcage" look-outs, a pity the GWR didn't employ them! Just to round things off, this little loco was also out for a spin today. It is one of the Sharp, Stewart & Co. 2-4-0s, originally built for the Cambrian in 1866 but seen here in its Swindonized form. 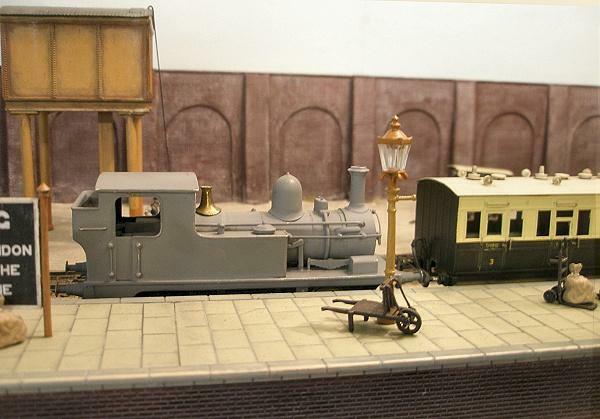 It's another ebay purchase and has been built (I believe) from the GEM / Mainly Trains kit. Not sure whether I'll ever get around to finishing it, as it is out of my period, but it trundles along nicely enough.